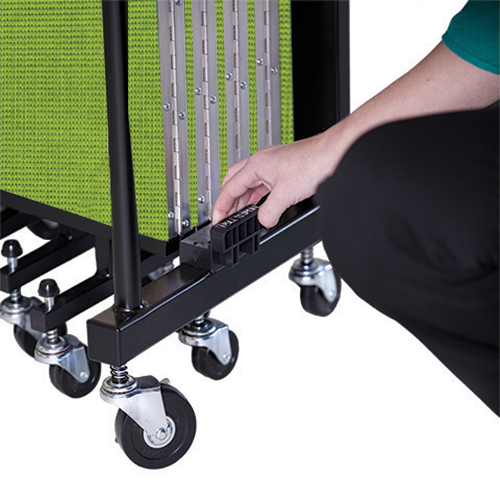 Screenflex portable room dividers are put into storage mode with a set of secure storage latches. The storage latches are essential because they keep the panels compactly together when moving folding room dividers from place to place. This tight configuration offers the user a clear view around the panels when rolling the divider from room-to-room or into position. With just a gentle pull, our latch lock releases the room divider panels from the locked position. Just walk the divider open into the desired configuration. Although the storage latches are near the base of the divider, we do NOT recommend using your foot to open the spring-loaded lock. Please reach down with your hand to gently release the locks on both sides of the divider. To store the panels in storage mode, simply close the divider panels together until you hear the latches automatically engage.